after the exciting and successful Forschungswerkstatt 2014 in Hamburg, we invite you to the VI. 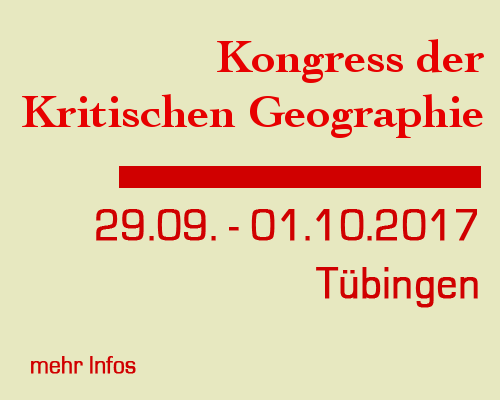 Forschungswerkstatt Kritische Geographie (workshop of critical geography) in Bonn! With this workshop we want to create space for common exchange of knowledge and various forms of working together apart from academic competition and standardized production of knowledge. The event will take place from June 18 – 21, 2015, at the Ermekeilkaserne in Bonn. The Ermekeilkaserne was seat of the Federal Defense Administration until June 2013. Today, the “Ermekeilinitiative e.V.” promotes the civilian use of the area after over 130 years. Thereby the association wants to create a place that offers space for cultural events and exchange. Since the ground is still part of the Institute for Federal Real Estate, photo IDs have to be passed at the entrance. The VI. Forschungswerkstatt Kritische Geographie should maintain the known format and will therefore have a mixed structure of presentations, plenary discussions, workshops, topic streams and events in the evenings. As always, the Kritische Forschungswerkstatt is not only for geographers, but for everyone interested within and outside of the academic spectrum! Donations: Unfortunately the event will not provide by itself. We would be very pleased with donations! As soon as our financial requests are processed we will let you know about the amount. There will be options to finance travel expenses partly and solidary. If you are interested, please send us an email to fowebonn2015@gmail.com! Need for accomodation (3€/night or sleeping place exchange) and child care can be indicated in the application form. When required we can offer whisper translation. On the weekend food will be provided by a vegan soup kitchen, which you can support with donations. Please spread the invitation through your networks!